It is important if you own your own home that you take out home insurance. The unexpected does and can happen and even if you think it is unlikely there is still a possibility of things like fire, storm damage or even a flood occurring. When you take out home insurance you should also consider contents insurance as your home insurance will not cover your personal belongings like your furniture, your clothes, jewellery, electronic equipment, your Westinghouse fridge or other appliances. House fires can start quickly and more easily than you would think. Common causes of house fires include faulty wiring, lit cigarettes being left and forgotten, candles being left alight and setting fire to curtains or furniture, or fires that start on the stove top. House fires can spread quickly and your whole house can be alight before you realise. Your insurance will cover you for any damage caused by a fire. The unexpected floods in Queensland early this year are evidence that water can do an incredible amount of damage. Flash flooding is destructive and can leave people homeless. Creeks and rivers can rise quickly and as the population grows many houses are being built on land that was once swamps, therefore during periods of heavy rain they naturally start to return to that wet state, and people living in these areas find they are subject to floods. Protect yourself by insuring your home which will cover you against flood damage. Storms can cause a lot of damage to a property. Wind and heavy rain as well as hail can break windows, cause trees and branches to fall across houses, lift up tiles and tin roofs and also cause localised flooding. The cost caused by a storm may be small or it may run into the thousands of dollars. 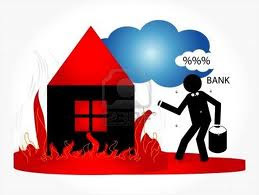 Don't take the risk by not having home insurance. Your insurance company will cover any damage that an unexpected storm might cause. Not everyone would be having to worry about cyclones. If you live in the northern half of Australia then cyclones may be an issue. Tropical Queensland, the coast of Northern Territory and in the north of Western Australia are all areas where cyclones occur. A large scale cyclone can completely flatten a house and the cost of replacing your home is likely to be something that would be impossible to do. If you live in an area prone to cyclone your insurance will cover you against property damage. Australia is fortunate enough not to be sitting on a fault line, but there are parts of Australia that have felt minor quakes such as Korumburra in South Gippsland, which experienced several minor quakes earlier this year. Any damage from these sorts of quakes is more than likely to be minor but it pays to be covered. If you live in a rural area, particularly in the bush, it is wise to have home insurance due to the possible threat of bush fires. As well as taking steps to protect your home from bush fire, such as clearing trees and foliage from around your home, you should also have insurance that will pay if your home is damaged or destroyed in a bush fire.